Caption slip reads: "Photographer: Rustan. Date: 1958-01-21. 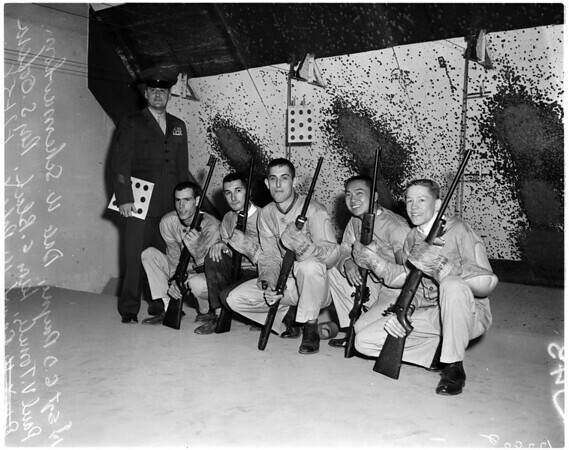 Assignment: University of Southern California NROTC Rifle Team. 1st Sergeant G.D. Payne, rifle team coach. 39-40: Dale W. Schermerhorn, team captain, senior from Omaha, Nebraska. 95-96: Paul V. Tometz, junior from Minneapolis, Minnesota. 5-6: Leroy G. Black, junior from Los Angeles. 43-44: Roy S. Gohara, Maui, Hawaii Islands. 5-6: Frank W. Robert, freshman from San Diego. (Various positions are prone, sitting, squatting, kneeling, and standing [off hand])".